In a time when the Indian economy is walking on a tightrope, teetering precariously with a danger of buckling over and falling sideways, mindless and meaningless religion politics still somehow manages to creep into the game. 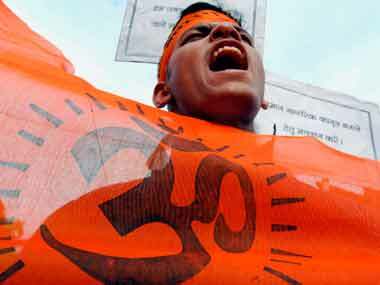 I saw yesterday that the prime time news-hour was comprised of unknown religious leaders debating (to be read abusing in Indian English) over the recent “ghar wapsi” revolution instigated by the most impeccable right-wing Hindu nationalist non-governmental organization called the Vishwa Hindu Parishad (VHP). The sangh which claims that its main objective is “to organise, consolidate the Hindu society and to serve, protect the Hindu Dharma” has somehow claimed that ‘it was due to their “struggle” in the last 50 years that Hindus have “regained” the lost “empire” of Delhi after 800 years.’ We were fools to have been celebrating Independence Day for the past 67 years when clearly India still isn’t a free “empire”, right? Shame on you Ashok Singhal! 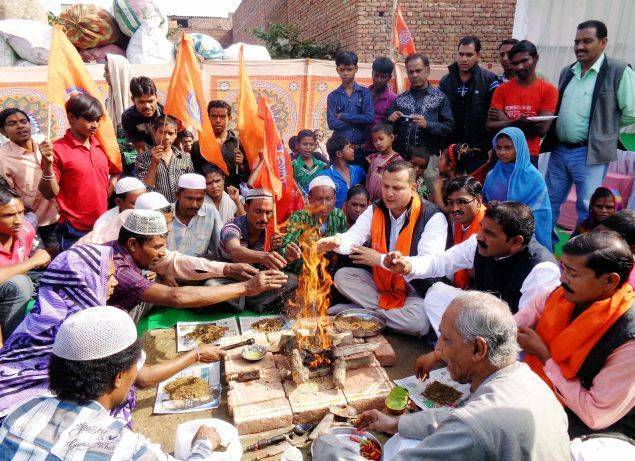 The movement started with the conversion of 57 Muslim families in Agra district of Uttar Pradesh claimed to be a ‘purkhon ki ghar wapsi’ (homecoming of our ancestors). All this was done under the pretext of providing BPL cards to the families. Next came Arnai village in Valsad on Saturday— where at least 500 tribal Christians were “reconverted”, thereby conveniently creating another controversy. Now while the nation and its leaders engage in blame games and denials, nobody gives a 5 paisa about the people involved. Who cares what gods we pray to when our families are dying of hunger? Who cares what gods we believe in when children still don’t have access to education? Who cares what religion we follow when our hard-earned taxpayer money is being euthanized, with no hopes of revival, under coal scams, telecom scams and whatever scams possible? India needs to come out of its ‘developing nation’ shadow. This country is the largest market for everything ranging from food to electronics. It has been the biggest supporter of e-commerce in a span of two years. This country just put a spacecraft on mars with the lowest budget ever! This country, this great country needs to start enduring. We need to do away with right wing political leaders who claim that “Our values will be gradually established in the country. We want an invincible Hindu society which works for the world’s welfare according to these values. We have never gone out to convert the world but to win over their hearts.” Looks like RSS, VHP and Bajrang Dal have been too inspired by Nolan’s time travel and are determined to push India back to 1715 from the era of 2015. How come everyone is embroiled in religious debate but no one is aware of the fact that it’s illogical, immoral and pointless if we really want ‘achhe din’ to be brought into this country. Shouldn’t the Indian social media be debating and commenting about this along with admonishing terrorists? How come people aren’t outraged by such meaningless and mindless activities being carried out in the name of a religion whose roots are embedded in harmony and not in denouncing others’ beliefs? It is the year of 2015. The government needs to concern itself with social upliftment for all. The PM’s policies are yet to be put into action properly. But already the government is being anchored down by the dead weight of communal outrage and religious controversies. The country needs to stop being afraid of these Saffron goons and ask law enforcement officials to start enforcing our human rights rather than party politics. For how long are we supposed to live in a shroud of Hindutva when clearly Humanity is at stake? A devout 22 year old Brahmin guy. I totally agree. The BJP does spread Hindutva. We need to rise above religion and faith. No matter what religion we follow, we all are humans. We need to realize that development can only be possible keeping in mind the beliefs of all sections of society. This is what BJP lacks. True. but It’s not BJP per se.. Just a certain faction.. BJP leaders within the party are now at loggerheads because of this issue. and BJP does have close ideological and organisational links to the Hindu nationalist Rashtriya Swayamsevak Sangh. That needs to stop. The appointed members need to be a better sect of people.